Square Footage: 895 sq. ft. - 1,610 sq. ft. Villages North scores high on our list of condo communities in this corridor. Price-wise, it's right in the middle. 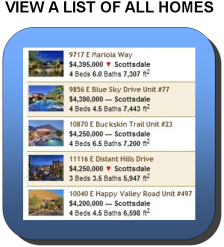 Higher than a condo at The Allison, but generally much less than the Cachet's at McDowell Mountain Ranch. Other than Signature, this is the most convenient community in regards to outside amenities. Right across the street to the south is AJ's Fine Foods, Starbucks, Chipotle Mexican Grill, Flo's Chinese, Walgreens and more. Just across the street to the northeast is Horizon Park which boasts 24 acres of basketball courts, volleyball courts, softball fields, a community center and dog park. The 101 Freeway is 2 minutes away, Spring Training at Salt River Park is 10, and you can be at Phoenix Sky Harbor International Airport in approximately 25 minutes. The condos were built in four phases from 1996 - 1998, totaling 456 units. The community is gated which many buyers prefer, and Towne Development did a fantastic job incorporating trees into the landscape design. They're literally everywhere, which gives you a tremendous feeling of privacy. A couple of other features we like are the relatively large patios, wood burning fireplaces (yes, there's a couple of days a year it's fun to fire them up), tennis court, and multiple pools and spa's. The monthly dues of $240.00 are typical for the area and include water, sewer, trash, pest control, roof repair, roof replacement, blanket insurance policy, common area maintenance etc. 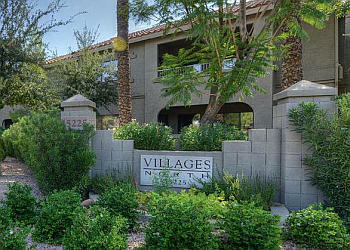 There are no private garages at Villages North. Each owner receives a deeded covered carport space. Additional parking and guest parking does not seem to be a problem as there's always a lot of open spaces available when we're showing condos at this location. 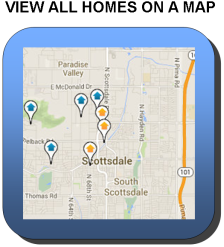 If you need a garage, your best bet is to take a look at the Cachet's at McDowell Mountain Ranch. The McDowell Mountain Golf Club (public) is located two miles to the northeast. Phil Mickelson's group purchased the golf club in 2011 and completely renovated and enhanced the course. Other courses in close proximity are the Grayhawk Golf Club, TPC Scottsdale and Starfire Golf Club (to name a few).